Some memories will never leave your bones. Timeless. Whenever, wherever, into forever. While I was a documentary maker for magazines, I got sent to Morocco and Qatar in 2013. I was writing and photographing a story about desert races, on horses. That’s where the love for the vast endlessness that a desert is, gripped me. The massive sand dunes, too huge to even comprehend how big they really are. Making you feel small, like icebergs do, in a good way. So imagine my excitement when I got to capture Danielle and Noah’s love. In August 2018, I drove the California Coast. Alone. A solo roadtrip. Seeing the Big Sur coast, was something else. It was exactly as I hoped it would be. It turned out I was dang lucky, as Highway 1 had just opened again, after being closed for a long time due to massive mudslides. It was over there, in Big Sur, where I met David and Callie. Adventurous, outgoing and with a wicked sense of humor. 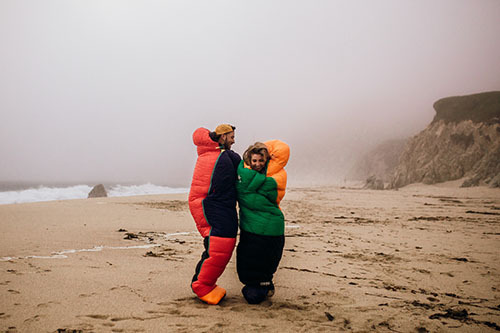 They took their Cotopaxi sleeping bags to the windy, rainy beach and snuggled up. ‘This is us’, is what she said. Meeting Marloes and Sebastien in Cape Town South Africa, two Dutchies like myself, was the perfect example of what I love about adventure elopements. Everything fell into place. We hiked up Chapman’s Peak on a beautiful summer day in Cape Town. Have a look at this most breathtaking adventurous elopement. I met up with Maria & Swain in South Africa, about an hour outside of Cape Town. We chatted about life at their insanely cool house, overlooking the Atlantic Ocean. As misty waves were rolling over the shoreline, kombucha in hand, they already started inspiring me. He, craftsman/carpenter/surfer. She, educator/passionate conservationist/owner of a bohemian clothing label. Both: professional life enjoyers and absolutelty mad about each other.